Here’s another of those perennially popular topics for web pages—a collection of new developments on layouts we’ve seen before. It’s a great source of information, updating, and inspirational ideas for us all. Encore! Haston Nomad has experienced several additions since we visited early last year. 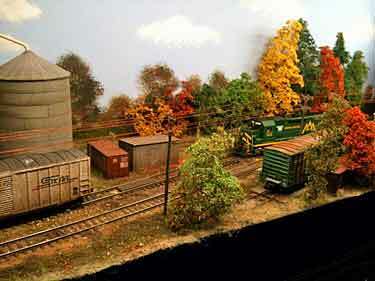 Chris Gilbert, from the West Midlands of England, moved the US-prototype setting from Wisconsin to Vermont, added a blaze of Fall color, and is tacking on an extra foot at each end of the shelf to extend the sidings and improve operations. The New England trees are particularly striking, as seen in these photos—and he’s thinking about adding an extra couple inches to the platform depth to accommodate even more trees. Note that Chris has done an excellent job with the often-forgotten chore of adding a carpet of bright-colored fallen leaves to the ground cover! 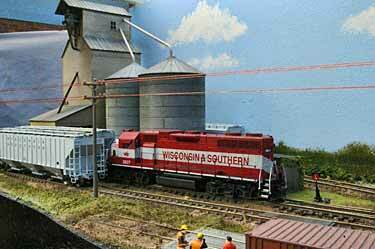 Plans are also in the works to convert the Midwest-style grain elevator to a feed mill, more appropriate for New England. 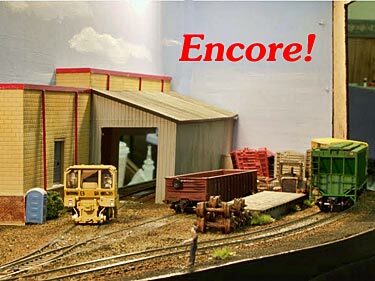 The updated layout is scheduled to appear at Model Rail Scotland in Glasgow from 25-27 February 2011. 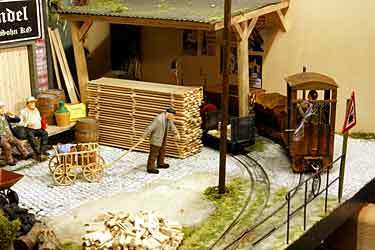 Each year Richard Glover and a few of his colleagues from the Greenwich and District Narrow Gauge Railway Society take some small layouts to the big French exhibition, RailExpo, in November. 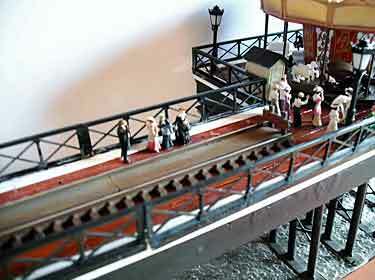 In 2010 Richard took along Moorside Station, which we last saw in 2008. 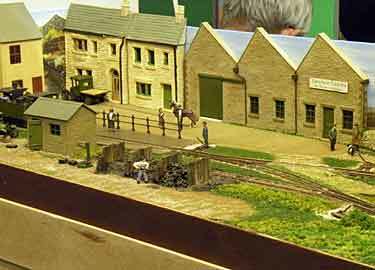 Feeling that the layout needed a little more lively look, Richard painted and added some human figures and a few period vehicles. 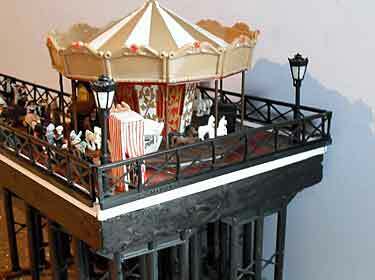 The results were immediate and dramatic… compare these scenes with the similar ones in Scrapbook #78. 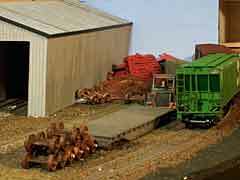 An intriguing feature of the Moorside layout design is its “plain-sight” fiddle yard which rolls out from behind a building (at the right rear, see our previous visit) and shows its last few inches of length as a sleepy storage yard where a few wagons can be parked from time to time. This capability perks up operations in addition to allowing normal “fiddle” maneuvers to be performed. 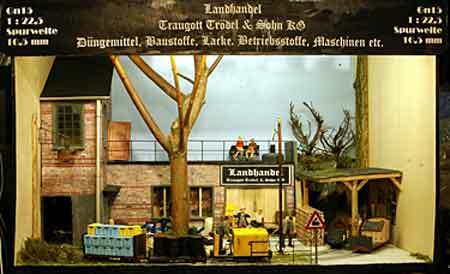 Nearly a year ago we saw an under-construction version of Landhandel Traugott Trödel & Sohn (Traugott Trödel & Son Farm Supplies), a Gn15 layout by Dr. Michael Giersberg, from Stülow, Germany. Now it’s approaching completion with many new details to examine. Michael also sent along a track plan (below), which was missing from our previous report. 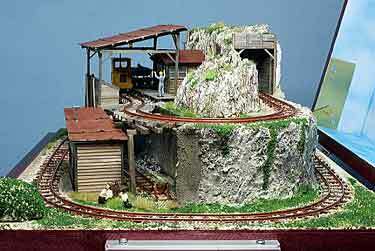 Many new photos have also been added to the layout’s thread in the Buntbahn.de forum. We first met Yutaka Nakai (nicknamed Yuta), from Kyoto, Japan, in Scrapbook #102a, where he presented his Karakuri Layout, a display-in-a-box design. 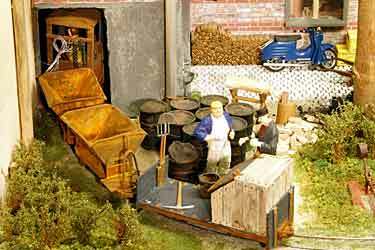 Now he’s carried the theme one more step, producing a two-level Karakuri II mining layout—including separate electrical controls for each level—that rises and falls when the box lid is raised or lowered. 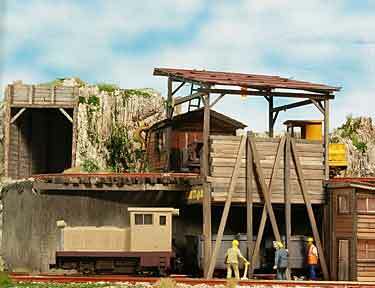 There’s more English-language information at Yuta’s website, and he’s produced a YouTube video to demonstrate both the layout and his battery-powered control system. 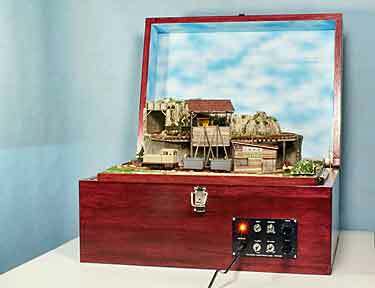 Yuta also added a portable battery system to his Kisakae Layout (featured in #104), and illustrated it in a YouTube video and a web page (way down at the bottom). 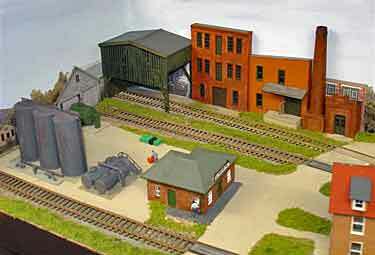 While many of us (justifiably) complain about the model media’s lack of attention to minimum-space layouts, Ian Holmes, from Princeton, Minnesota USA, is doing something about it. 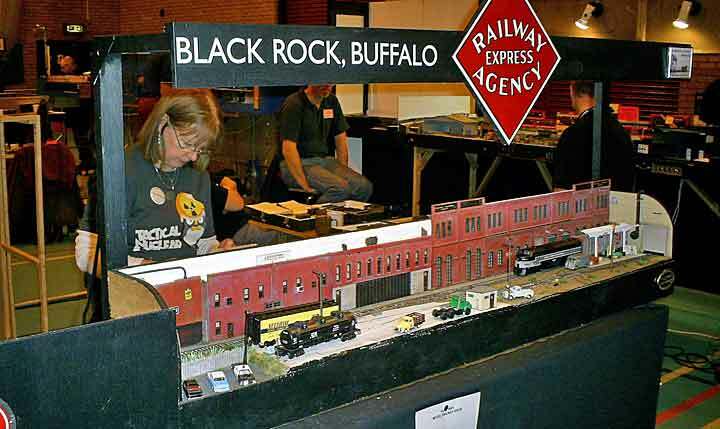 At the end of last year he attended his second World’s Greatest Hobby show (this time in Saint Paul, Minnesota) bringing a micro layout with him! 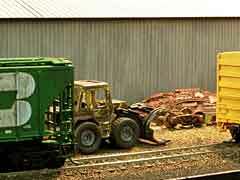 This one was Wingett’s Recycling, first seen here in Scrapbook #94. Jim Ramnes from Wadena, Minnesota, covered the exhibition photographically for his blog, and graciously allowed us to reproduce a couple of his shots (above). 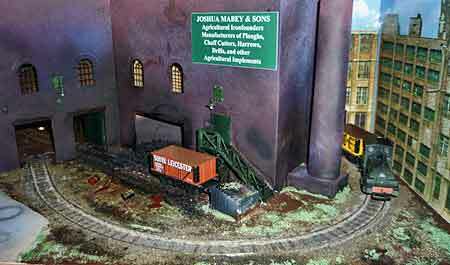 At left are Lorrie and Ian Holmes, looming over the displayed layout, whose polished, English-style presentation opened a lot of eyes among show visitors. 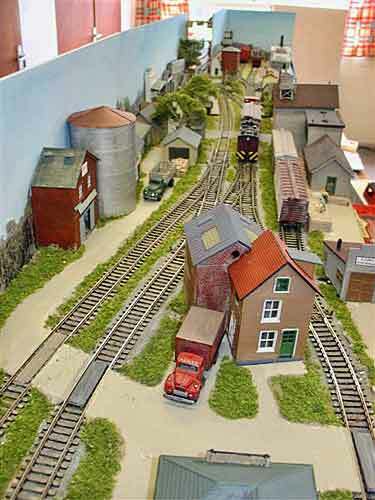 There are virtually no minimum-space layouts at most WGH shows, so such a well-turned out small exhibit was a double surprise that attracted lots of attention. 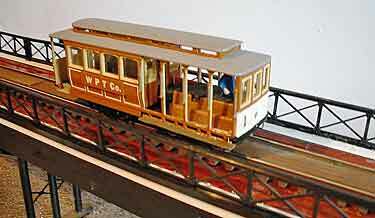 Lorrie is a fully-trained operator who conducts her shifts “on the layout” with charm and poise. To add to his pleasure, Ian was approached by a representative of a national modeling magazine who was interested in possibly covering the layout in his publication. How’s that for getting attention? 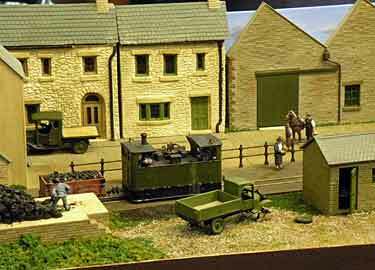 Ian’s adventures at the show are described, along with details of the layout and tales of other exhibitions, in his entertaining blog. 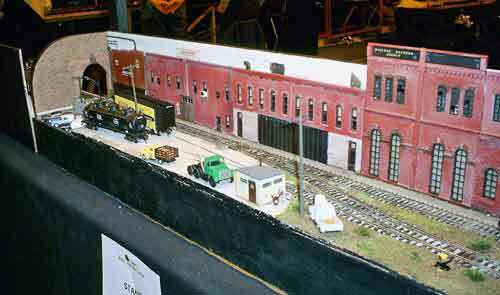 We first glanced at Robert Forde’s little OO industrial switching layout in Scrapbook #91a, to note its unusual platform—a 22x14in (56x36cm) computer monitor stand. Now Robert, who lives in Clevedon, in southwest England (near Bristol), has “filled in the blanks” and sent along some photos of his scenery. Robert explains, “The line represents the tail end of one of the small industrial lines which could be found in rural areas and small towns in Britain up until the early 1960s… I recently exhibited it at the Nailsea Model Railway Club’s Open Day (December 2010), where it attracted a great deal of attention although it was by far the smallest layout in the show. Perhaps for this reason, lots of people wanted to stop and talk about it. I named it Mabey Works, although in fact it kept going very well all day.” Robert points out, though, that the 6in radius curves impose limitations on the locomotives and rolling stock that can be used; for this reason, he’s planning his next micro layout to be a little larger. Three years ago, when we first toured Giles Barnabe’s Lazy River exhibition layout, it was a simple kickback track plan measuring 48x15in (120x38cm). 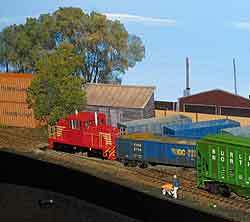 Recent changes have added some bustle to its operations… the area to the left, originally designed as a three-road traverser, has been replaced by a scenic 40in (102cm) baseboard which completes the runaround loop (passing siding) and adds several new industries. Giles, who lives in London, announced the changes in Scrapbook #96a, and now has them ready for the spring 2011 exhibition scene, bringing the layout’s length to a little over 7ft (2.2m). Photos show the new board which still lacks some weathering and detailing. 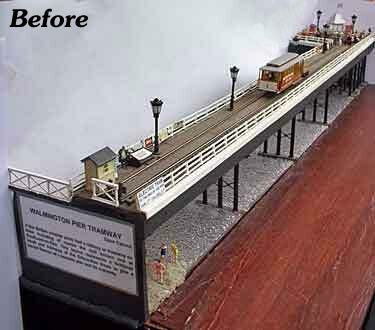 AFTER ten years attending over 50 exhibitions, Dave Carson, from Stowmarket, Suffolk, England, has refurbished his venerable Edwardian pier layout and rechristened it New Walmington Pier for the 2011 season. 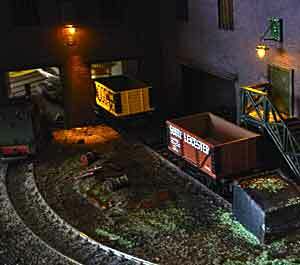 This layout first appeared in our original Micro Layout Design Gallery! Black Rock, Buffalo was introduced to these pages while still under construction by Steve Grantham, from Bubwith, North Yorkshire, England (see Scrapbook #101 for details and a track plan). 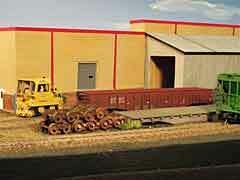 Now nearly complete, the little US-prototype HO layout made its debut in November at the train show sponsored by Steve’s club, the Hull Miniature Railway Society. Here are a couple photos taken at the show.